krismulkey.com: Exercise + Breakfast. It's a good thing. Exercise + Breakfast. It's a good thing. We had an awesome bike outing last Sunday to Sausalito. It's a short ride (~5 miles) from our house. It was a gorgeous, sunny, non-foggy Sunday morning. Not too windy. Not too cold. Just right. 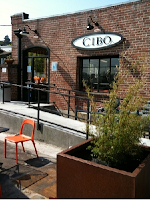 Our whole purpose was to go and have breakfast at a new restaurant called CIBO. It was awesome. 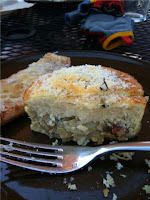 I had a delicious Fritatta with bacon and potato. 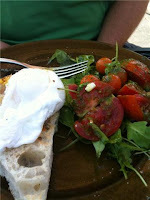 Don had poached eggs on toast.With the most amazing heirloom tomato salad on the side. Elli couldn't stop mooching Don's breakfast. And Elli had raspberry shortbread cookies. It was 10am. She eats breakfast at the crack of dawn. It was snacktime for her! And of course they have coffee. Really delicious coffee from Blue Bottle Coffee. They brew it one cup at a time as you order it. They don't give it to you in one of those old diner cups either. All the food is served on Heath Ceramics dinnerware (based in Sausalito.) So not only are you eating delicious food. It's sitting on a beautifully designed plate too. If I had some extra cash I would buy all new dinnerware from Heath Ceramics. Ok, so that's probably not the first thing I would buy with extra cash. But it's one of those things I would love to have. Sort of like the spiral wine cellar. Only way cheaper than that! Anyhow, after the bike ride we decided to take my bike to REI for a tune-up. I've had the bike less than a year. And for some reason it won't stay in gear. It just changes. Especially when you shift to the higher gears. The chain has fallen off twice now. So it needed a tune up. We load everything on the bike rack and take off for REI. And that's when the trouble started.